This week I spotted some gorgeous leggings in Zara and I just had to buy them for Jack. I must have at least 7 Zara Leggings and have more on my wish list. I love how stretchy they are and the prints are fantastic. These leggings were £6.99 from Zara and have music notes on. Myself and Wayne are musicians and absolutely loved this print. The top was also from Zara and was £8.99. The top has small trumpets on it and has a lovely button detail at the front. The long sleeves are also perfect for those chillier days. Jack's boots are from the Little White Company. They are super soft and fluffy! 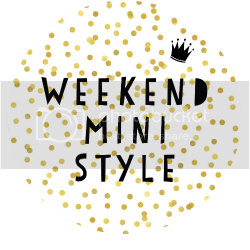 This is my first Weekend Mini Style post. Be sure to link up!